Just when you were beginning to think that all ultra-compact cameras had to be rectangular and sharp, along comes the Mju-Mini Digital S with its sloping curves and irregular angles. This alone is enough to set it apart from the crowd but our review model, as sold in Boots as part of a breast cancer-awareness scheme, also happens to come in shocking pink. The Mju-Mini is the cheapest camera in the group but it still manages to pack a very respectable feature list. As well as a 5Mp CCD sensor, you get multi-point, centre and spot autofocus options and both multi-segment and spot-metering modes. Likewise, there are fully automatic, manual, slow-sync and red-eye flash modes and no fewer than special 15 scene modes to play with. However, more accurately reflecting the lower price, the camera only features a 2x rather than a 3x zoom lens, with an equivalent range of 35-70mm, a relatively paltry 1.8-inch LCD and a comparatively small 320 x 240 pixel maximum movie size. 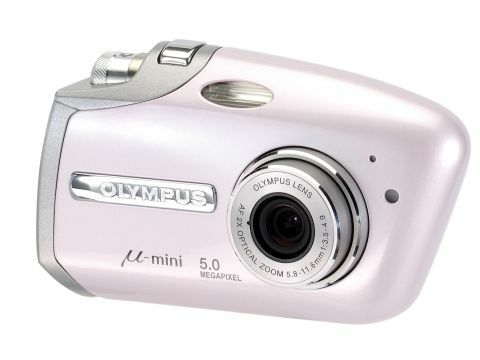 Like the Fujifilm Z1, the Olympus uses the non-standard xDPicture Card memory format and is supplied with a 16MB card, as the camera has no internal memory. There's also no docking station but the camera does come with a mains charger and the Li-ion battery pack should be fine for 160 shots between charges. At the price, the Mju-Mini Digital S has a lot going for it, not least in terms of image quality. The lens proved nice and sharp in our tests and colour rendition was extremely natural. And while the Pentax Optio WPi is the only camera in the group to be fully waterproof, the Olympus is splash and rain-resistant, wearing its 'All-Weather' badge with pride. All in all, it's a great little camera for the money.